This is the launch title in an amazing new series that tells the incredible story of the Horus Heresy, the civil war that almost tore the Warhammer 40,000 universe apart. 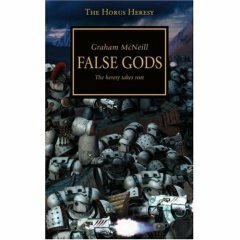 Penned by the Black Library's best-selling authors, the Horus Heresy range will pull no punches, dealing with classic themes of honour, duty and betrayal in a unique SF setting. After thousands of years of expansion and conquest, the human Imperium is at its height. His dream for humanity accomplished, the Emperor hands over the reins of power to his Warmaster, Horus, and heads back to Terra. But is Horus strong enough to control his fellow commanders and continue the Emperor's grand design, or will such incredible power corrupt him? Graham McNeill continues the story of the single most important event in the history of the Warhammer 40,000 universe. 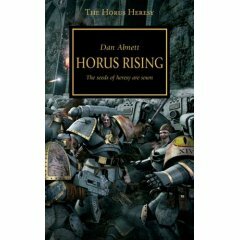 For years, fans have been clamouring for novels about the Horus Heresy - the bloody civil war that set Space Marine against Space Marine and nearly spelled the end of mankind at the hands of the traitor Horus. The second book, in the initial trilogy, will be a springboard for a full range of books set during this terrible war - when gods walked amongst the stars and the Emperor of Mankind ascended to the Golden Throne. "False Gods" takes the epic story onwards as Horus struggles to keep his armies in line and the seeds of his downfall are sown. Having recovered from his grievous injuries, Warmaster Horus leads the triumphant Imperial forces against the rebel world of Istvaan III. Though the rebels are swiftly crushed, Horus's treachery is finally revealed as the planet is razed by virus bombs, and Space Marines turn on their battle-brothers in the most bitter struggle imaginable. Ben Counter brings the opening trilogy of this epic new series to explosive life as the Horus Heresy begins! Having witnessed the events on Istvaan III, Deathguard Captain Garro seizes a ship and heads to Terra to warn the Emperor of Horus' treachery. But the fleeing Eisenstein is damaged by enemy fire, and becomes stranded in the warp. Can Garro and his men survive the depradations of Chaos and get his warning to Terra in time?